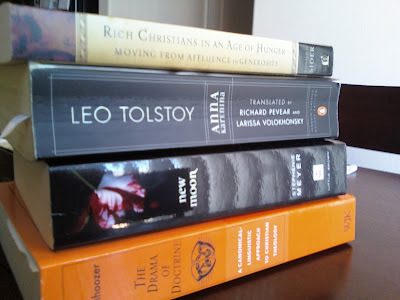 This is what I've been reading lately--only uber-thick books. Well, Ron Sider's book is only 350 pages. But it's gonna take awhile to wade through all of these. I've been reading Anna Karenina off and on for over 6 months, and I'm barely halfway through! Props to you bro! That's my next goal as well...tackle some massive reads...and by the way, nerds rock!! !